The library ebook distributor OverDrive announced on Wednesday that their ebooks were now compatible with Kindle FreeTime. 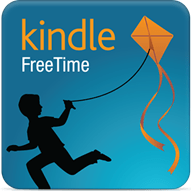 Kindle FreeTime (not to be confused with the paid Kindle FreeTime Unlimited service) is a suite of parental control software that Amazon has built into the Kindle Fire Android tablets and the Kindle ebook readers. It allow parents to filter or restrict certain content to protect their kids from mature material, stop the kids from messing around with the device’s settings, and otherwise lock down one of Amazon's devices. And today OverDrive announced that their ebooks were compatible with Kindle FreeTime. (They weren't already?) Parents can check out ebooks from more than 20,000 schools and libraries in the US and use them with Amazon’s Kindle FreeTime. 3) Select “Books” from the dropdown menu. 4) Check the box next to the desired title and tap “Done” in the upper right corner. The title will be added. OverDrive is the only library ebook provider integrated with the Kindle platform, and that integration is still limited to the US. Tablet owning parents outside the US as well as those who don't have a Kindle Fire might want to consider adding the OverDrive Android app to your kid's tablet. That will probably take less effort since it would only have to be approved once, rather than repeated each time an ebook is checked out. More details as well as an FAQ can be found in Amazon’s Kindle support pages. I think the Kindle Freetime function is a great idea. Kids are always hankering after using new technology like the Kindle Fire or an iPad, so being able to limit their access to only suitable content is a nice feature. It is good to see that a big library like Overdrive is prepared to follow this type of initiative and make their service compatible.